This gothic horror masterpiece from Werner Herzog is presented here in its original English language version. This 1979 gothic horror masterpiece from legendary German director Werner Herzog (Fitzcarraldo, Grizzly Man, Cave of Forgotten Dreams and Aguirre, Wrath of God) is presented here in its original English language version, fully restored by the BFI. 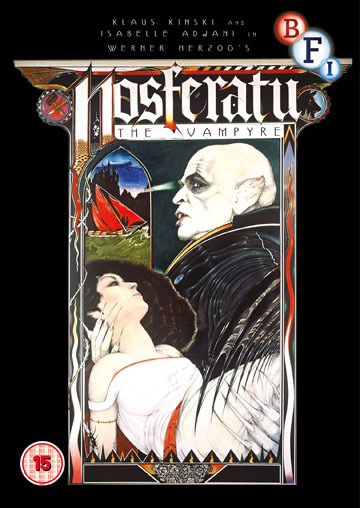 Inspired by FW Murnau's 1922 silent classic, Nosferatu stars Herzog's regular collaborator Klaus Kinski as Count Dracula, Isabelle Adjani (Possession) as Lucy Harker and Bruno Ganz (Downfall) as Jonathan Harker. Popul Vuh's ethereal music builds a mesmerising undercurrent that combines with Herzog's rich visuals to create one of horror and world cinema's most hypnotic and seductive experiences. This painstakingly restored presentation is accompanied by a fascinating on-set documentary.